The Smith Sisters sing with beautiful harmonies, and have recorded with stellar musicians such as Doc & Merle Watson, Mark O'Connor, and Sam Bush. This is the Smith Sisters fourth album. Debi (lead vocals, guitar, bodhran) and Megan (vocals, electric bass) are the Smith Sisters. With Al Petteway suporting them on vocals and guitar, they recorded this album live at the Birchmere in the Washington DC area. This album has been touted as their best, due to the beauty of their live show, and th stellar guitar work of Petteway. Performing together since 1981, the Smiths' show embodies a blend of original, traditional, and country-folk tunes interspersed with warm, humorous interaction with each other and their audience. 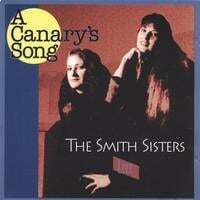 The Smith Sisters attracted attention when their debut album, Bluebird, released in 1983, was produced by the late Merle Watson and featured guest appearances by top-ranked bluegrass pickers including Sam Bush, Mark O'Connor, Doc Watson and T. Michael Coleman. But, it was their octave-spanning vocal harmonies that truly showcased their musical strengths. Although they've followed their own paths, Philadelphia-born Debi Smith and her younger sister Megan continue to reflect country warmth and harmonious texture as The Smith Sisters, and still occasionally perform together. Debi Smith, who also performs and records with the Four Bitchin' Babes, remains at the core of The Smith Sisters' sound. Equally skilled at acoustic guitar, bodhran and piano and possessor of a three-octave vocal range, Smith writes most of the duo's songs and sings lead. Megan keeps arrangements anchored on electric bass and sings harmonies that blend naturally with her sister. These songs reflect the Smith's Virginia heritage, not heard elsewhere. Excellent performances. Their east Virginia twang comes through if you recognize it.